Here’s a chance to read again one of our old Local History Room columns, first published in November 2011 before the launch of this blog . . . The Pekin Public Library’s Local History Room files on H.H. Cole are augmented with materials shared the Peoria Public Library and the Tazewell County Genealogical and Historical Society. From these documents, a fairly complete story of Cole’s life can be easily reconstructed. Cole was a born July 24, 1833, in Gilbertsville, Otsego County, New York, on July 24, 1833, the youngest of 10 children of Richard and Emily Morgan Cole. In New York, he and his older brother Roderick learned the art of the Daguerrotype, the earliest successful photographic technology. They came to Illinois in 1850 when Henry was only 17, and Roderick opened a studio in Peoria. At first Henry worked for his brother, but in 1851 he opened “Cole’s Fine Art and Photographic Gallery” in competition with Roderick. After several years of rivalry, Cole bought out his brother in 1859, and Roderick gave up photography and became a dairy farmer. H.H. Cole’s business at Main and Washington streets in Peoria was destroyed by fire in 1861, so Cole moved to Adams Street opposite the Peoria County Courthouse. In starting anew, Cole went to Chicago and paid $50 (then a considerable sum) to learn the new Ferrotype (or tin-type) paper photograph technology. He is said to have been the first man in Illinois outside of Chicago to take paper photos. A second fire on Jan. 29, 1869, destroyed his studio and all his negatives, and he relocated to a building at Jefferson and Hamilton. Facing financial hardship in the 1870s, Cole closed his Peoria studio and moved to Tazewell County in the spring of 1879. He first settled in Mackinaw, but in November he moved to Pekin and opened a studio at 317 Court Street. Later he opened a second studio in Delavan. Active in Pekin’s community life, Cole attended the Pekin Congregational Church and was elected an alderman on the Pekin City Council while William J. Conzelman was mayor. Our Local History Room files include a copy of Cole’s “Souvenir of Pekin,” a collection of his photos of prominent Pekin homes and buildings of the day. Cole also photographed about 2,000 of the notable men of Tazewell County, a collection that previously had been long displayed at the Tazewell County Courthouse. Copies of Cole’s notable men are available for purchase from the Tazewell County Genealogical and Historical Society. Cole semi-retired in 1911, moving to Tuscarora in Hollis Township, Peoria County, between Pekin and Bartonville. There in 1914 he built “Tuscarora Lodge” using materials from the old Tazewell County Courthouse and from Rose Villa, the old Henry Westerman home in Pekin that had been demolished to make room for the Carl Herget Mansion at Buena Vista and Washington streets. The walkways around his home were built using stone and marble left over when the new courthouse was built. 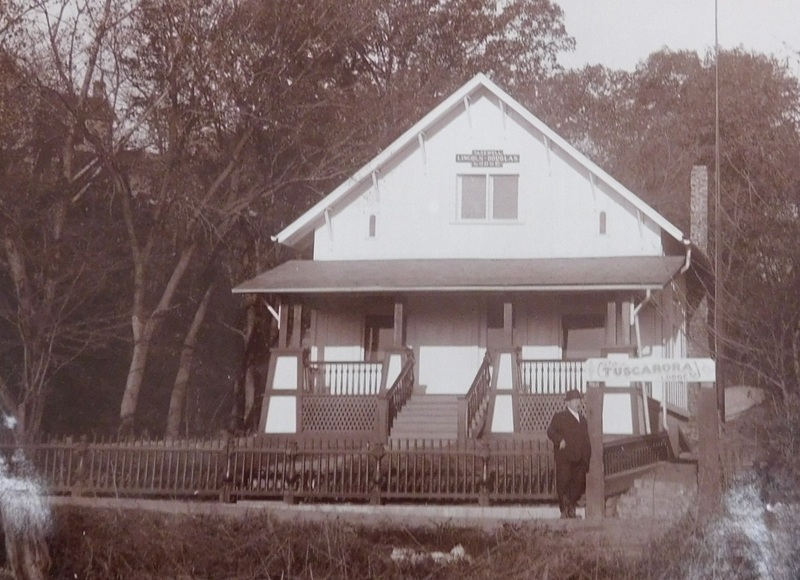 A photograph of Cole proudly standing in front of Tuscarora Lodge was included among the mementos preserved in the recently opened time capsule that was placed inside the cornerstone of the new Tazewell County Courthouse in 1914. Attaining the age of 92, Cole died at Tuscarora Lodge the evening of Dec. 9, 1925. His pastor, Rev. Walter Heyl, officiated at his funeral at Noel Funeral Home in Pekin, and he was buried in Springdale Cemetery, Peoria.